1-3-1 setup with 1 bringing up the ball, 3 and 4 at the high posts, 2 on the wing and 5 in the low post. 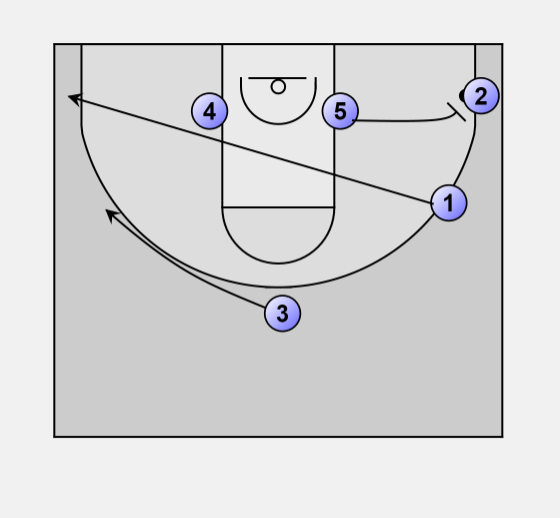 The play starts with 1 passing the ball to high post position on the side where 2 is standing on the wing, then he curls around 3 at the other high post to fill the opposte wing. 3 steps out to receive the pass from 4 at the top of the circle. 3 passes to 1 on the right wing. 4 screens away from the ball for 2. 2 cuts through the lane towards the strong side corner, looking for the ball. After setting the screen for 2, 4 rolls to the block on the weak side. 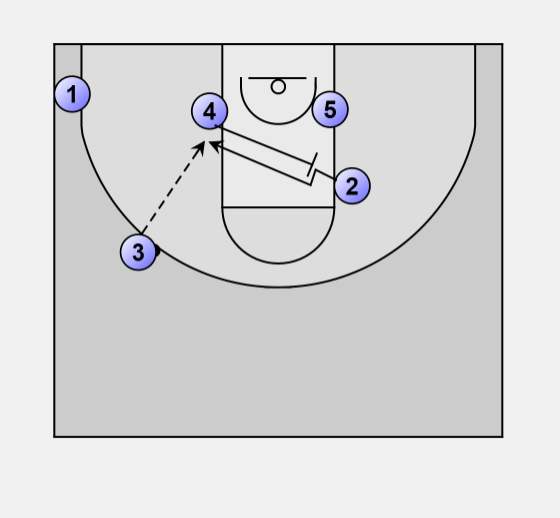 If the defender of 4 or 5 slides over to take away the pass to 2, 1 can throw a lob to 4 or get the ball into the post to 5 for a quick score under the basket. If these options are not availabe, the play continues with 2 cutting to the corner to receive the pass from 1. 1 clears to the weak side corner, 3 fills the weak side wing. 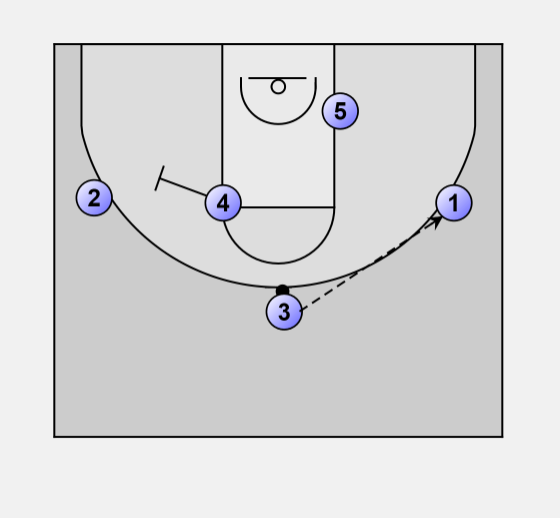 2 and 5 play the pick & roll game, with 5 rolling hard to the basket. Ideally, 2 will get the ball to 5 who is rolling the basket. If the defender of 4 comes over to help against 5, 2 can pass to 4 under the basket. If the defender of 1 reacts to that and comes over from the weak side corner to help against 4, 2 can instead pass to 1 for an open corner 3-pointer. If these options are not avaible, 2 will pass out to 3 on the wing. 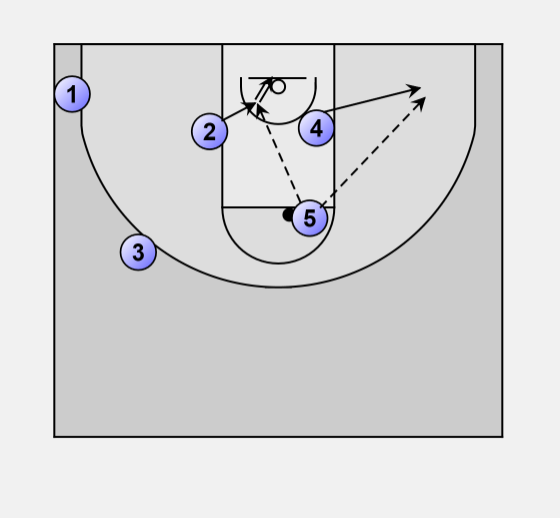 4 sets a cross-screen for 2 who moves to the left block. 3 tries to enter the ball into the post to 2. 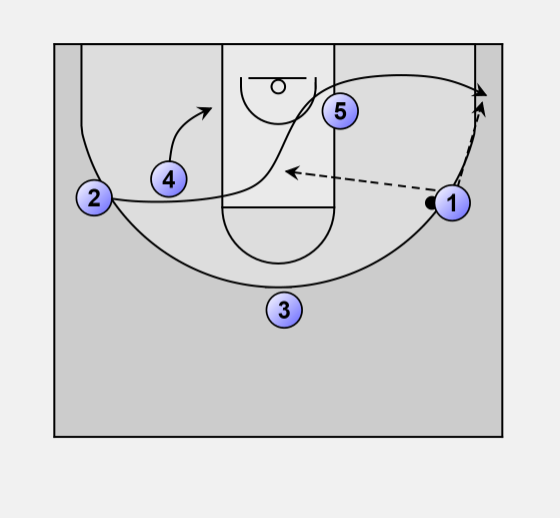 If 2 is fronted, 5 will flash to the high post using a pindown screen by 4 to receive the pass from 3. 2 turns to the basket and looks for the ball from 5. 4 steps out to the baseline. If his defender sinks into the paint to take away the pass to 2, 4 will get the ball along the baseline for an open jumper.